I am a fan of anything white. I used to have a big crush with Wheel of Fortune’s Vanna White, love watching Redford White’s slapsticks when I was young and would feast on fried white leghorns anytime of the day. But lately, I noticed that I was hitting a snag with a lot of “whites in my life.” First, I found out that the whitening facial wash that I bought last month was down to its last drop and I can’t even see any effect on my face at all. Then, I read a college bud’s Facebook wall post that it was snowy now in Canada that means she just beat me in our who-will-first-experience-white-Christmas race. To top it all, my white polo office uniform is still missing up to this day since our home in Pasig City was soaked in flood water two weeks ago. But in the midst of these sort of unfortunate events, I have learned a lesson that I want to share: there is White at the end of a tunnel! Last week, my wife and I, with the help of her sister and some friends, decided to conduct a relief goods drive for the victims of the flood. I wrote an open letter and posted it to different social network sites asking for help in behalf of my neighbors who that time were experiencing difficulties in getting food due to the chest-deep water in our area. 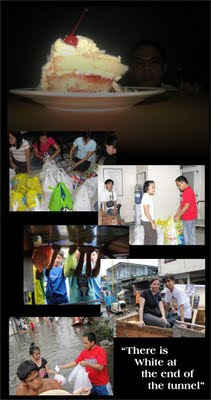 Good Samaritans answered our plea and we conducted the distribution of the relief goods last October 10. It was not an easy task because of the many obstacles that we met along the way. It started when our vehicle was flagged down by two traffic enforcers but was later “pardoned” when told them that we will deliver donations to flood victims. Next problem was we were outnumbered by the sacks of donations but found helping hands who offered assistance when they learned about our intention. The biggest issue came when it was time for us to cross the 4 feet-high dirty water for us to go to our site. Thank God for those creative people who turned truck tire’s interiors, plastic containers and even busted airbeds into boats that carried us to reach our target area. We were able distribute bags of groceries to more than 70 families in Lupang Pari in Brgy. San Miguel, Pasig City. It was such a great experience to be able to help those in need with the fact that I am also a typhoon Ondoy victim. It was a tiring but worthwhile Saturday and I just have two things in mind on our way to our temporary home (house of my in-laws in Q.C. while we wait for the flood in Pasig to subsides) --- a hot shower and a great merienda. When we arrive at the house, another snag… brown-out for the nth time that week! I did get my hot shower since I was perspiring to death. But God knows how to reward good deeds, alright. On the table, we saw a box of Red Ribbon cake. When I opened it, I saw light! 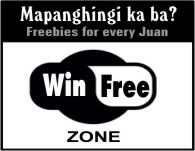 It’s the new Red Ribbon’s White Forrest just like the ones I see in news paper ads and tarpaulins that always get my attention every time I pass by the Red Ribbon store in Shaw Blvd., Mandaluyong on the way to way. Somebody must have been listening when I told my wife one time that I wanted to try White Forrest and will buy a whole next pay day. I found out it was my mother-in-law. And soon the whole afternoon was filled with exchanges of stories of what happened that day and in spite of the power outage, everyone was perked up. I know Red Ribbon’s White Forest has something to do with it. I know because with all the troubles we've been through that day, all the ill feelings we had were white-out with every bite of delight of this great new dessert experience called White Forest.